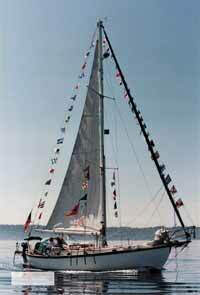 Tethys was custom built in 1982 by an eclectic team of shipwrights and engineers in the historic seaport of Port Townsend, Washington. Modeled in the Colin Archer genre of Norwegian double-enders, Tethys is a fiberglass, cutter-rigged sloop with a full-keel. She is 38 feet long on deck, 46 feet overall, almost 12 feet wide, draws 6 feet and weighs 19 tons. Inside she is beautifully finished in teak, holly, cherry, yellow cedar and bird’s eye maple. She is fully equipped with all ocean going safety equipment: radar, electronic instruments, wind vane, Ham/SSB radio and all the resources necessary to sail around the world. The name Tethys comes from Greek mythology. She was a Titan, consort of Oceanus and the Goddess of Nurturing. Tethys is the original name of the boat. Nancy was living on her 1927 classic wooden boat when she first saw Tethys’ new hull under the Ballard bridge. She befriended the builder who was planning to sail around the world. When they set off, Nancy thought Tethys, her ideal ocean boat, was gone. In 1987, set on her own circumnavigation, Nancy was surprised to find the boat again. Nine months later, Tethys changed owners, but not her purpose. She and Nancy have been together ever since.